"	Levitating speakers are speakers that are suspended in mid-air through the use of magnetic fields. This process may sound futuristic - and, honestly, they may look like something from a spaceship - but this type of technology has been around for several decades. Despite the commonplace history of this technology, levitating speakers have been unheard of; this is because of the lack of large brands endorsing the trendsetting idea. However, in 2017, this changed when several larger electronic companies introduced their versions of these innovative speakers. Now, levitating speakers are all the rage, and they will soon be as popular as mp3 players and laptops. " BLUETOOTH CONNECTIVITY - [Compatible with all devices with bluetooth connectivity] Connect wirelessly from a distance and seamlessly stream from your bluetooth-enabled device. Also equipped with a built-in microphone to enjoy hands-free conversations. 360 SOUND PROJECTION - Integrated with 5W Hi-Def speaker for louder sound and stronger bass. Levitation of the speaker allows 360 degree rotation for a richer listening experience. LED VISUAL EFFECT - Bring life to your favorite tunes with the accompaniment of LED visual lights. How Do Floating Speakers Work? Magic – would it not be cool if that was the answer? They look magical, or like something from a science fiction movie. However, this is not the case, the speakers operate on something many may consider boring; science. To understand how levitating speakers operate, it is helpful to remember science lessons from school. Magnets repel each other, and it is impossible to force two magnets to touch. That is how the levitation in the speaker is created. The magnets in the speaker and base produce oppositional forces; these forces counteract gravity, and this allows the speaker to float above its base. However, to do this, the magnets must be much stronger than the ones students used in science class. They must have the ability to create a magnetic force that is powerful enough to support the speaker, and to maintain it for an extended period. Another fascinating aspect of the product is the magnets, also, allow the speaker to be removed from the base. The speaker can be placed on any metal surface, and the magnets will support it. Not only will your friends be amazed that the speaker levitates, but they will be fascinated that it can be placed in quite a few different places. However, it is important to assure the surface is a metal which attracts magnets. Any metal that contains iron, cobalt, or nickel will support a magnet; steel, for example, will attract a magnet because it contains iron, but stainless steel will not. Concerning the functionality of the speaker itself, the elevated portion produces 360-degree sound, and the base usually acts as a subwoofer; however, the function of the base differs and is dependent on the model of speaker. A buyer should read reviews before purchasing a product. A consumer should educate themselves with the positives and negatives of merchandise before buying any device. Not only will reviews help a potential buyer avoid terrible products, the process can, also, be enlightening for narrowing down products which possess the features they desire. Reviews will mention the sound quality, design, and features of each speaker – among other things. Reviews will enable them to understand the product they choose to purchase, and they can be aware of any potential problems that may develop with it. Before purchasing, it is vital to research the brand of the speaker. Is it designed by a well-known company? If not, does the company have reputable business history? It is, also, important to review a company’s return and replacement policy. Will a buyer receive a refund or a replacement if the product is defective? If purchased online, which party pays the return shipping? These are questions that should be considered, and it is always essential to expect the unexpected when purchasing a product. It would be unfortunate to have to return a device and not have the ability to do so. A buyer should consider the design of the speaker, as well. The life of the speaker will be dependent on the quality of the material used to build it. Higher quality products will be purchased at a higher cost, but they will last longer and survive more bumps along the way than their cheaper counterparts. Quality is better than quantity, and this is true when it pertains to levitating speakers. With the number of speakers on the market, a buyer will be able to choose one that suits the décor of their house or room. If a consumer wants to travel with the speaker, they should consider the ease of transport. If it is to be transported, size and durability should be taken into deliberation. Precautions may need to be taken when securing some speakers to preserve the life of the product; many companies will not replace a product if it is damaged due to neglect, so protect fragile objects accordingly. The features of the speaker are another factor to reflect upon. Some have Bluetooth, while others only have an auxiliary jack. Various products have LED lights that are in-sync with the music, and some can charge without any prompting from the user. The features will be listed in the specifications of the products, or they can be found in reviews. Another important thing to consider is the strength of the speaker. How loud does the speaker need to be? It is understandable that the device will not be as powerful as a sound system in a car, but a user will want something powerful enough to produce quality sounds. The ability of the speaker is dependent on the wattage. The wattage will not only affect how the speakers sound, but it will affect how loud it can be. When purchasing the speaker, it is necessary to have knowledge of the volume it can be safely operated at; operating a speaking at too high of volumes can damage it. 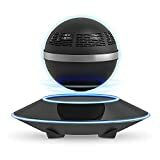 If a consumer is looking for a speaker that can be a conversation starter and produce quality sound, a levitating speaker may be the product they are searching for. The appearance, ease of use, and features of most levitating speakers are mesmerizing. With the amount of choices on the market, it may be hard to decide on a speaker; however, once a consumer chooses, it will be one of the most fascinating products they have purchased.